Collins Booksellers - Computational Transport Phenomena for Engineering Analyses by Farmer, Richard C., 9781439882054. Buy this book online. Although computer technology has dramatically improved the analysis of complex transport phenomena, the methodology has yet to be effectively integrated into engineering curricula. The huge volume of literature associated with the wide variety of transport processes cannot be appreciated or mastered without using innovative tools to allow comprehension and study of these processes. Connecting basic principles with numerical methodology for solving the conservations laws, Computational Transport Phenomena for Engineering Analyses presents the topic in terms of modern engineering analysis. 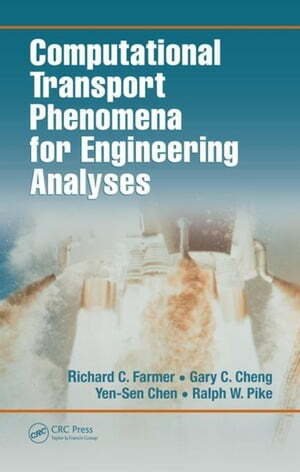 The book includes a production quality computer source code for expediting and illustrating analyses of mass, momentum, and energy transport. The text covers transport phenomena with examples that extend from basic empirical analyses to complete numerical analyses. It includes a computational transport phenomena (CTP) code written in Fortran and developed and owned by the authors. The code does not require a lease and can run on a PC or a supercomputer. The authors also supply the source code, allowing users to modify the code to serve their particular needs, once they are familiar with the code. Using the CTP code, grid generation and solution procedures are described and visual solution presentations are illustrated thus offering extensive coverage of the methodology for a wide range of applications.